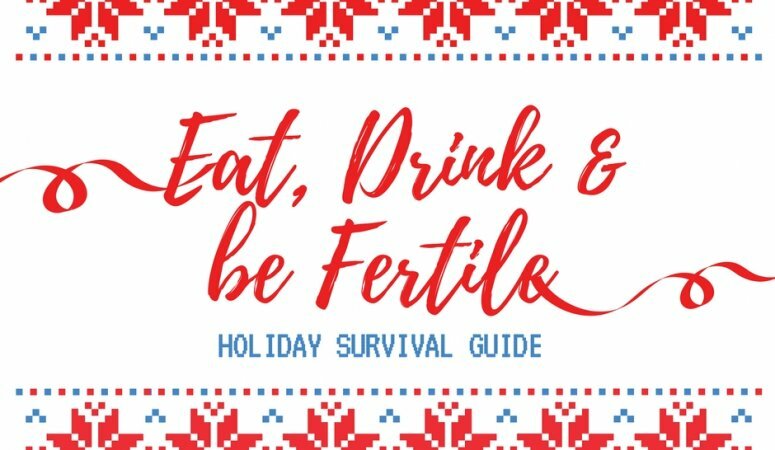 Yup, it’s that time of year, and you are likely wondering how in the WORLD you will get through the holidays and still stay on track with your fertility. It’s true, the holidays come with it a lot of cakes, sweets, wine & cheese, and… S-T-R-E-S-S. You will be back-and-forth between family & work parties, shopping, prepping last minute things for work before holidays, hosting, and tempted to the EXTREME to eat everything and anything offered to you. The holidays are even tougher when you are living with infertility. Christmas/Hanukkah and New Years are extra hard because most of the activities planned are focussed on Kids. Santa Claus Parades, family events, Santa at the Mall, presents, family get-togethers… Kids are everywhere! Yuck. You are finally on the right track and are afraid of what the holidays are going to do to you. I get it! Here are some tips to help you along throughout the holidays without getting ‘set back’, but still enjoying yourself. Prep Yourself – So rule #1: Prepare yourself as much as possible for what’s to come. Winter is coming! You can expect there to be TONNES of kids around, and family members asking “when are you going to have a baby”. You should also be prepared for pregnancy announcements; they are inevitable, but don’t feel guilty for feeling sad. On a completely different note, prepare yourself to be tempted by the alcohol, cheese, desserts, and more. This isn’t an easy one to avoid, but YOU CAN DO IT if you prepare yourself ahead of time. So, in a way you are preparing yourself mentally, emotionally and physically. Regretfully Decline – Yup, I think it is safe to say that there is WAY too much going on through the holidays. I personally have a holiday party every weekend, PLUS 2 birthdays, PLUS Christmas Eve, Christmas Day and Boxing Day events. This isn’t even including New Years (oh boy!). One thing that has helped me stay calm so far is declining holiday parties and a birthday party. You need to establish when enough is enough for you. In addition, avoid events that you KNOW will make you feel uncomfortable or stressed. It isn’t worth it, and people who care about you will understand. Reward Yourself – Create incentives for yourself. For example, reward yourself with a delicious gluten-free/vegan brownie (Try these –> they are gluten free, vegan and PALEO) after passing by the buffet dessert table at a guest’s house. Or, after spending time with your nieces for a few hours, treat yourself to a mani-pedi. Whatever makes you feel great! Steer Clear of “those” family members – Everyone has those family members that love to ask us when we are going to get pregnant and start a family. By now, you know who they are. Duck behind your Uncle Ted, dive under the Christmas Tree, whatever you do, steer clear! Most are truly well intentioned, but getting asked this over and over again can be stressful. You can also politely respond with “When we have some news to share, we will” then change the subject. De-Stress Daily – I totally vote for laying low this year and spending some quality time at home to be grateful, meditate, and set intentions for the coming year; however, I get it if you are into the craziness of the holidays. It can be fun too! So what I do suggest is setting some time aside daily to recuperate and rest, and this means physically AND mentally. Go for a Manicure, a walk in nature, take a hot bath, or read that book that’s been collecting dust on your shelf. Your adrenal glands will thank you! For some extra tips, click here! I wrote these de-stressing tips a while back and they WORK! Prep some yummy (healthy!) holiday treats and beverages (and eat before!) – Alternatives are going to be your Saviour. I even sometimes EAT BEFORE I go to holiday events so I’m not tempted by what’s in front of me. Trust me, if you are starving it makes it 20x worse. Here are some HEALTHY EATING tips! Starters – Start your meals with salads or soups, and vegetables. If you can, bring your own oil and vinegar dressing to avoid those sugary ones. Watch the cream-based soups and opt for broths instead. Main dishes – remember that protein sources from vegetables versus animals is better for your fertility. Try the vegetarian option, as long as it isn’t loaded with gluten and cheese. Animal proteins like fish, chicken or turkey are better than beef or pork options because they are less inflammatory. Dessert – Protein with your meal will curb your sugary cravings. But if you MUST have dessert, find a dairy free and gluten free option if possible, and fruit is even better. You can always bring your own delicious raw energy balls as well. Stuff them in your purse…nobody with ever know! Call on your Support Team – You may be feeling great for a few days then fall into a slump. Don’t ignore your feelings. Instead I invite you to recognize them and call upon a family member or friend you can trust. Don’t feel like you need to push your feelings aside to put on this facade of cheer during the holidays. Ask for a hug, a cup of tea to chat, or just a listening ear. I’m here too, don’t forget. Feel free to drop me a message on the Facebook Group or reply to this email. Coping with Loss – Coping with loss during the holidays is so hard, especially if it is a child. You will want to surround yourself with people that support you and love you. Share memories, and share what you are all grateful for. In a time of despair, there is always light and good things surrounding you. How have you grown and changed since the loss? What can you look forward to in the future and coming year? I love these 6 Tips on Coping with Grief throughout the Holidays. So there y’all have it. Your 8 Step Survival Guide to get you through the holiday season! My gift to you all this season: I AM SENDING LOVE, LIGHT AND POSITIVE FERTILE ENERGY TO YOUR WOMBS AND YOUR HEARTS. Be open to receiving this gift!